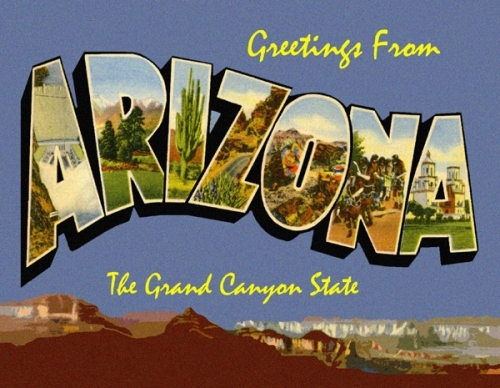 Greetings From Arizona Custom Postcard - Custom original only available at Legends' General Store. Text on back: Greetings from Arizona. From the Grand Canyon to Tucson, Arizona's storied past reaches back thousands of years and today's visitors enjoy it's tall mountain ranges, swift rivers, grasslands, sand dunes, and cactus forests. Postcard is brand new and in mint condition.